2) Your teaching schedule and any pertinent scheduling info for Fall 2018 (to help us identify meeting times). 3) Identify a course for which you would like to design a Community Learning component, and when you plan to teach it, sometime within the next two years. Also include a one-paragraph course description, projected enrollment, and describe types of students (e.g., majors, non-majors; intro or upper-level). 4) What preliminary ideas do you have for integrating Community Learning into this course? How would it deepen student learning and connections with Hartford? Feel free to brainstorm about potential connections, as we realize most applicants are newcomers to the area. 5) Describe any prior experiences or knowledge you plan to draw upon to achieve your goals above. 6) What kinds of support do you need to achieve your goals above? How can other Trinity faculty and staff help you? Feel free to contact Megan Hartline (Associate Director of Community Learning) or Jack Dougherty (Director of the Center for Hartford Engagement and Research, CHER) to discuss your ideas or ask questions. 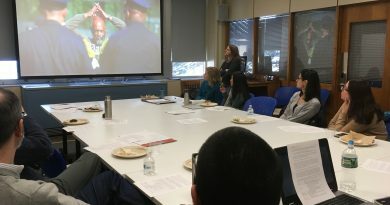 We will listen and try to connect you with Hartford-area community partners and other faculty and staff who share mutual interests.